LET’S FINE-TUNE THE STRINGS TOGETHER. You’ve just experienced one of Molly Lord’s masterful workshops. Your self-awareness is expanded and it’s singin’ a new tune. However, you’re recognizing a call to something greater and are wondering… NOW WHAT? THE NEXT STAGE OF YOUR HERO’S JOURNEY WITH MOLLY BEGINS….NOW! WHAT DIRECTION IS NEXT FOR YOU? POWER TUNE-UP! Which Archetype is calling you? Together we’ll explore how to tap the gifts of that archetype in your personal and professional adventures. Discover a wider range of operating productively in relationships, your health, and your spirit. Next, develop your customized song list that gives that archetype voice and to experience being in the driver’s seat of masterfully changing your tune! Lighten the weight of your Orphan archetype stories and transform the LEAD INTO GOLD! Build inner tools to transition out of feeling victimized. Learn cutting-edge techniques to dissolve the anxiety of stories that no longer serve you. RECLAIM YOUR POWER…GET THAT MOJO BACK ! 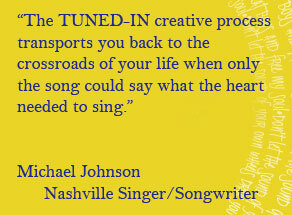 CREATE “THE SOUNDTRACK OF YOUR LIFE” Exclusively for TUNED-IN Workshop Grads! JUST DO IT! I will be your guide in simplifying the process of researching, organizing, and producing the “Soundtrack of Your Life!” The journey of pulling together your soundtrack is as meaningful as the end result. Imagine having your completed personal soundtrack – IN HAND! Yup. Finished. Your life – captured in song. A stunning experience.